The horn of the goat, or in some representations, a unicorn, starts at the pineal gland in the head of the animal and then stretches to the south-west for about 2/3 of a mile, as Ponters Ball rises about 20ft in elevation. 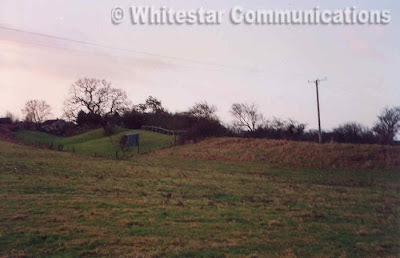 The Capricorn figure itself ranges over an area of about four miles across north-eastwards in the direction of Shepton Mallett, stretching from Havyatt at the head/horn (closest to Glastonbury) to Launcherley Hill at his hind leg. On our alchemical journey walk in December we focussed on the horn as being the potent symbol of initiation, the threshold between worlds, the experience of cornucopia (nature’s abundance), and the realisation of our true nature. 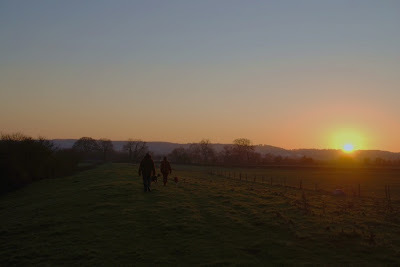 So, having parked our cars in a makeshift little parking bay off the A361, we crossed the road and walked through the field down to Norwood Farm on the nose of the goat and then back up through the head to the pineal gland gland, all the while blessed with the most stunning views of Glastonbury Tor. The pineal gland at the base of the horn is also considered by Serena Roney-Dougall to be the third eye point of the Glastonbury figure. Serena has identified third eye points for most of the zodiac figures and indeed most of them are water features in the landscape. In the Capricorn figure a stream extends north-eastwards from the pineal gland and it is indeed a powerful spot. From there we walked up toward the horn. And here’s a shot of us walking along the horn. A curmudgeonly old gatekeeper lives at the house by Ponters Ball where it crosses the A361 – a real Saturnian figure – and he prevented us from taking the short cut to rejoin the horn across the road, so we we had to take a roundabout route via the Baltonsborough road and cutting the across fields on the north side of the A361. We then began our walk along the horn in ritual silence. It was a deeply profound, moving experience and one I would highly recommend you do as and when you have the opportunity. It seemed an entirely appropriate way to enter the new year.